Thanks to the folk over at Signature Entertainment, we have a bunch of great horror movie DVD to give away. 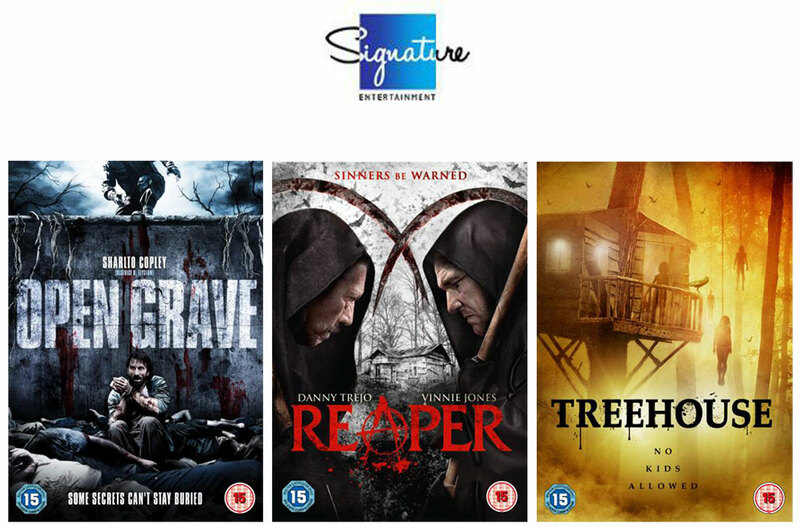 1st prize is 3 DVDs including Reaper, Open Grave & Treehouse, and we have 2 runner up prizes of Reaper & Open Grave! B-movie icons Danny Trejo (Machete Kills, TV’s Sons Of Anarchy) and Vinnie Jones (X-Men: The Last Stand, TV’s Elementary) star in this inventive slasher that follows a death row inmate who survives execution and returns as a supernatural force known as Reaper. Descending on an isolated hotel which happens to be the meeting place of some very dangerous players, the Reaper’s thirst for blood is only matched by one wily girl’s thirst for survival. You can listen to our interview with Reaper Director Phillip Shih here! With a weight of fan anticipation already behind it, Sharlto Copley, the breakout star of District 9 and Elysium, star in this taut chiller that centres around a man who wakes up in a mass grave. Rescued by a group of fellow survivors, he then has to establish if he, or one of his saviours, is responsible for the grave in the first place whilst also dealing with an even more deadly threat. Also starring Thomas Kretschmann (Captain America: The Winter Soldier, Downfall). From the director who brought you The Zombie Diaries comes Treehouse, another journey into the dark heart of horror. Local kids are going missing and animals are turning up mutilated. When Killian and Crawford short cut through the woods to get to a party, they begin to discover why and face a pitched battle for their lives into the bargain. The competition closes on 23rd October 2014 and is open to UK residents aged 18 or over. oooh scawy movies. yesh please! I’d love to win!